Our first examples of division of algebraic expressions involve simplifying and canceling. With this example, we'll break it into 2 fractions, both with denominator 4q to make it easier to see what to do. After you have had some practice with these, you'll be able to do it without separating them into 2 fractions first. Recall the following when dividing algebraic expressions. The reciprocal of a number x, is `1/x`. For example, the reciprocal of 5 is `1/5` and the reciprocal of `1 2/3` is `3/5`. To divide by a fraction, you multiply by the reciprocal of the fraction. I take the top expression (numerator) and turn it into a single fraction with denominator x. The x's cancelled out, and we have our final answer, which cannot be simplified any more. I recognise that I have "/x" in both the numerator and denominator. So if I just multiply top and bottom by x, it will simplify everything by removing the fractions on top and bottom. I am really just multiplying by "1" and not changing the original value of the fraction - just changing its form. I cannot simplify any further. Before we do an example using algebra, let’s remember how to do long division with numbers first. Let’s do 23,576 divided by 13. Now, to divide this, (assuming we do not have a calculator) we could proceed as follows. 23 divided by 13 = 1 with remainder 10. We bring the 5 (the next number after 3) down. We continue until we get to the last number, 6. We use a similar technique for long division in algebra. We are dividing a polynomial of degree 2 by a polynomial of degree 1. This is algebraic long division. Step 1: We look at the first term of (3x2 − 11x − 4) and the first term of (x − 4). 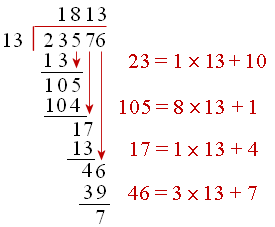 We write 3x at top of our long division and multiply (3x)(x − 4) = 3x2 − 12x to give the second row of our solution. Step 4: Divide x (in the 3rd row) by x from the (x − 4) in the question. Our answer is 1 and we write "+ 1" at the top of our long division. Next, multiply (1) by (x − 4) to get the 4th row. You can check your answer by multiplying (3x + 1) by (x − 4) and you'll get (3x2 − 11x − 4). Once again we are dividing a polynomial of degree 2 by a polynomial of lower degree (1). This is algebraic long division. Step 4: Divide 4x by 2x. Our answer is 2 and we multiply 2(2x + 1) to get the 4th row. Step 5: Subtract, and we are left with 4. You can see how algebraic long division is used in a later section, Remainder and Factor Theorems.